Santorini is a volcanic Island group at the central south end of the Cyclades in the Aegean Sea (Greece). As a popular tourist destination in Greece, it is renowned for its spectacular sea-filled volcanic caldera sourrounded by steep colorful cliffs, the beauty of its villages and fields. Dominantly explosive, with effusive activity during intervals. Powerful explosive, so-called Plinian eruptions appear to occur every 10-30,000 years. Construction of lava shields and minor to irregularly spaced subplinian explosive activity during interval times. An earthquake swarm has been occurring near the island since this morning. So far, 16 quakes of magnitudes between 2 and 3.9 and at depths ranging between about 30-6 km have been detected. The quakes are clustered about half way between Santorini's SW end and the Christiana Island group. 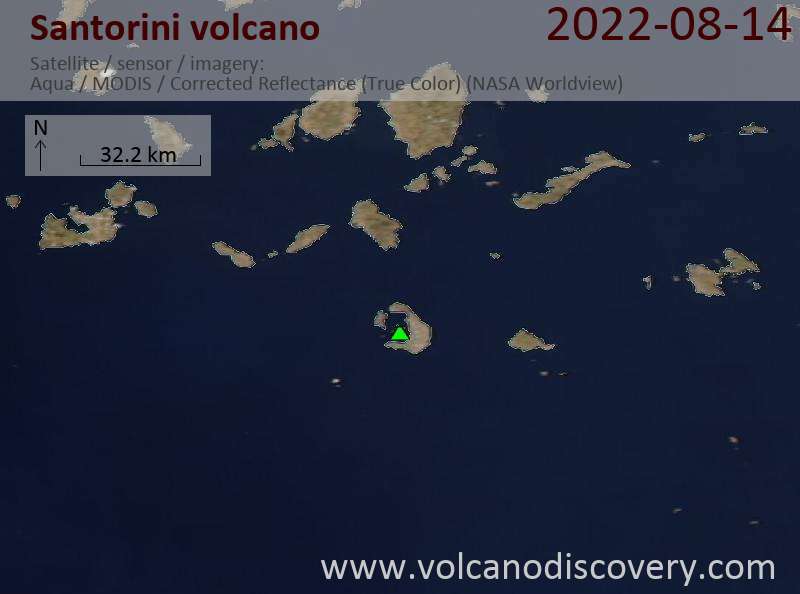 The strongest shock with magnitude 3.9 occurred at 10:27 local time and might have been felt weakly by residents of the southern part of Santorini. Although the quakes are near the Kameni line, a tectonic lineament in SW-NE direction which has been the preferred location for magma ascent (i.e. formation of volcanic vents) in the volcano's past few 100,000 years of history, there is currently no indication that the earthquakes are volcanic in origin. It is much more likely that they represent a normal tectonic event. 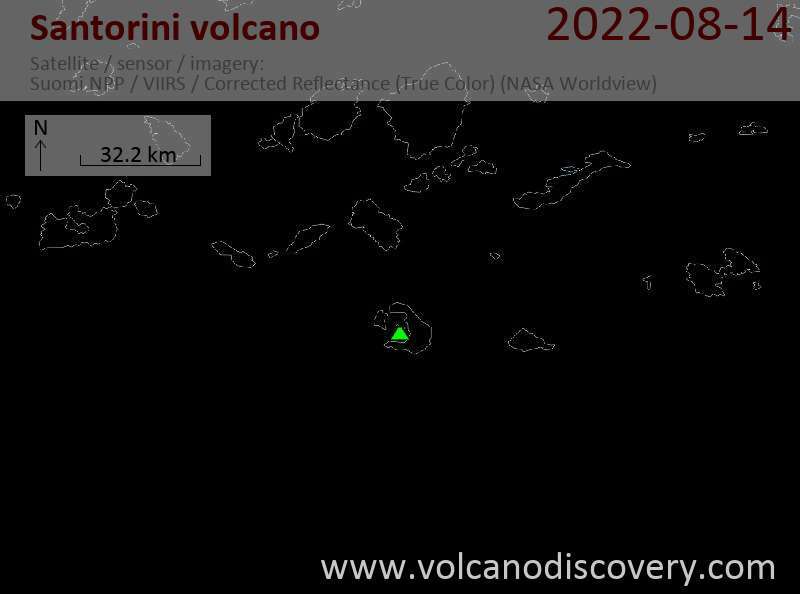 However, Santorini being both a popular tourist destination and an active volcano, the situation merits close monitoring. Seismic activity has showed a small increase again: a small swarm of earthquakes has occurred just east of the island at depths between 6 and 15 km. The "largest" quake (not felt) was a small magnitude 2.4 event at 12.5 km depth yesterday. For now, this small swarm probably means nothing unusual.